Waiting to go on at Chapter on Friday night gave me time for thoughts like, ‘I’ve forgotten all the songs!’ and ‘What if I blast out a high note all on my own in the wrong place?!’. It was reassuring standing between my first Soprano compatriots. Starting with You’ve Got Time was so cool: Clap Clap, Stamp! – like saying, ‘Shut up and listen everyone, the Songbirds are here!’ After that our voices rang out and if I hadn’t been so busy concentrating on Rosie’s conducting (and great facial expressions!) I reckon I’d have shed a tear for the beauty and strength of the sound we made together. Saturday morning my partner Anne and I found the lovely Songbirds banner and joined the march. Having come out as a young lesbian at the time when Maggie Thatcher was banning the ‘promotion of homosexuality’ and scorning ‘pretend family relationships’, I still find it pretty amazing to see the police and the public smiling at us and sporting rainbows (though I’m not sure why everyone was waving flags with a rainbow-coloured chicken on!). It was a bit hard singing Love Shine a Light and Bread and Roses with the samba band drumming in front of us, but what we lost in finesse we made up for in volume. All ending up at the Angel Hotel was a great idea, their posh toilets saving us from the Portaloos in the park. Backstage the excitement of meeting Heather Pearce (and taking selfies with a balloon unicorn) kept us busy until they called ‘Songbirds on next!’ (at which point panic grabbed me again but was banished by a quick verse of Valerie). We lined up on the stairs, then climbed to the heat and brightness of the stage. 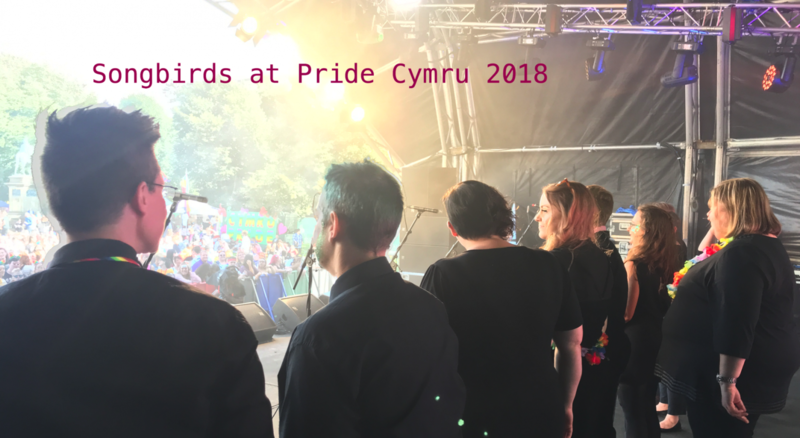 Then we were off, feeling pretty damn proud as we channelled Amy Winehouse and Adele… it all seemed to be all over in moments, and I can’t wait to do it again next year (how about singing with us next time, Heather?). Songbirds Choir is a non-auditioning community choir for self-defining LBT women in Cardiff. We have now moved to Monday nights! 7.15 for a 7.30 start at City United Reformed Church on Windsor Place, Cardiff.